This article first appeared in The Edge Financial Daily, on January 29, 2016. AFTER checking out everything luxury at the Detroit Auto Show last week, I spent some time at General Motor’s (GM) Heritage Center. The complex is about 48km from downtown Detroit and houses 4,570m of old paper archives (that’s a dozen Empire State Buildings stacked on top of each other); plus, the multiple warehouses there hold more than 400 cars made at one time or another over GM’s 100-year history. The centre is not open to the public, but you can make an appointment for a private visit. If you do go, I suspect you’ll both have a great time and be surprised by what you find. I know I was. Seeing all that early technology in one place, I was struck by how much of it is not too different from what we expect in cars today — in fact, much of the stuff that many drivers think is new and freshly innovative was actually innovated decades ago. Take radar crash avoidance, for example — it’s more than 50 years old. And alternative drive modes? We’ve definitely been there and done that. I also loved seeing a lot of the old concepts at the Heritage Center that didn’t make it today, having been cast aside because of budget cuts and increasingly stringent US federal safety regulations. The V16 engine, for example, never came back to life because it drank massive amounts of fuel and would incur federal gas-guzzler penalties. I saw some crazy, oblong radar cones that aren’t aerodynamic enough to pass wind-resistance tests and huge tail fins that hid gas caps, but which would require too much sheet metal to be economical. 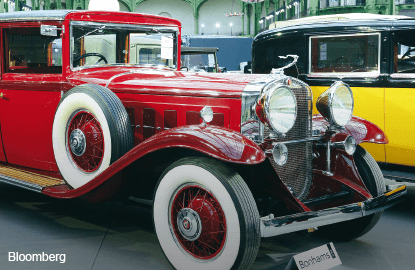 The cars listed below aren’t necessarily the very first to contain each technology, but they are notable examples of its use. Notable car: 1915 Cadillac Type 51. Okay, these are a far cry from the automatic, road-smart, powerful light-emitting diode headlamps we have today. But the idea behind them definitely started in 1915. That was the year Caddy introduced tilt-beam headlights, which were operated by a handle on the dash and were an early form of high beams. It proved a major advance in night-time visibility and set the standard for others to follow. Notable car: With the 1931 Cadillac V16, the marque became the first domestic car manufacturer to release a production-model version of a V16 automobile. It came with a then extremely high 165-horsepower engine, could hit 130kph, and came in 10 body styles with nearly limitless colour options. Consider it the Ferrari LaFerrari of its day. The manufacturer’s suggested retail price was an expensive US$6,500, roughly US$100,000 (RM421,000) in today’s dollars. 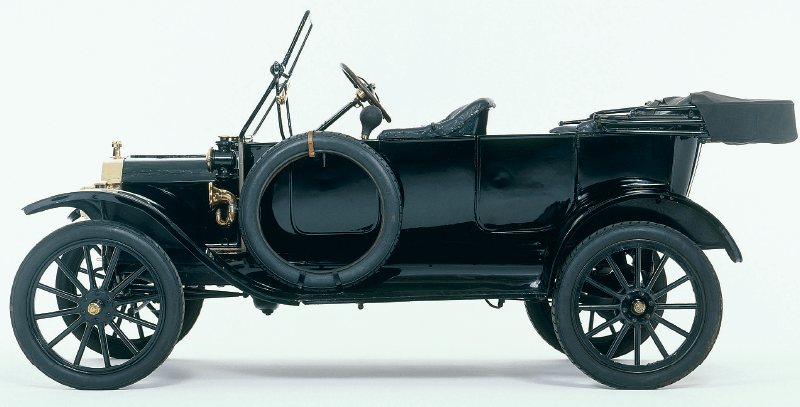 Notable car: 1914 Ford Model T — the very first mass-produced car. Oops, did you stall it? No problem. Put on the emergency brake; place your left foot on the clutch to keep the car in neutral (it will jump into second if you don’t); adjust the slim silver electric moderator lever on the steering wheel; and reach down below the bench to your left by the door to push the start button. Just like every luxury car today with their push-button starts — only way more complicated. Notable cars: Cadillacs in 1933 came with a ride selector — essentially a lever — which allowed the driver to adjust the suspension damping/rigidity to improve the drive and handling on the fly. Tighter for smooth, fast roads. Looser for uneven terrain. This wasn’t quite a “sport” or “eco” mode, but it got the process started. 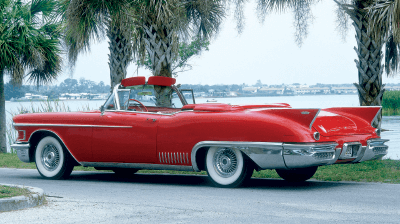 Notable car: While a Le Sabre concept car was the first to show a novel rain sensor in 1951, the technology first appeared in production on the 1958 Cadillac Eldorado Biarritz convertible. The system worked by automatically closing the convertible top and raising the windows when sensors on the side of the car detected rain. Notable car: 1903 Model A Runabout. This was the first Cadillac (and the one closely copied by Henry Ford). It had a single-cylinder engine and was known colloquially as the “Model A”. The front portion had a bench seat, and the back came with two removable seats — one positioned on each side. Notable cars: Cadillac and many other smaller brands (for example, Tucker) had a lot of models in the 1940s through the 1960s that obscured the fuel input — all the better for making wide clean lines along the sides of the body. An ingenious one made by GM was the 1955 Caddy Coupe DeVille, which hid it under one of the large tail fins. To access it, you pushed a little button and lifted up the top of the cap over the light at the top of the fin. Notable cars: Many of them. In 1911, Woods Motor Vehicle Company introduced the first gasoline-electric hybrid car in Chicago. (Germany was producing electric cars as early as the 1880s.) More recently, in 1973, GM made the Urban Electric Car and promoted it for its electric battery and tiny two-seat design. GM hasn’t released too many stats about that car — it had a huge front swinging door and was just a concept, after all — but it was heavily discussed and photographed charging its battery at an important symposium on low-pollution power-system development during that time.